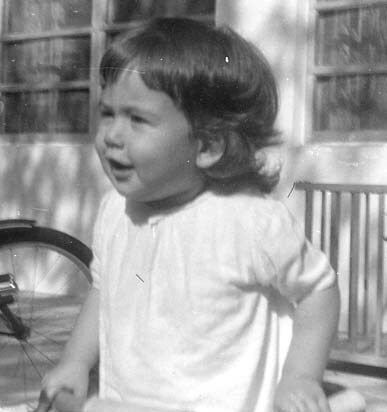 1954 Constanza romps around in the backyard of the house on Almeria Avenue. 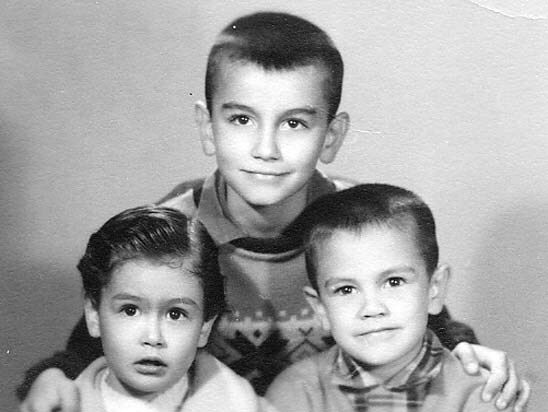 1954 L-R: Constanza, about 12 months, Big Bro Edgar, 5 and Danny is about 2, looking smart for their passport picture. 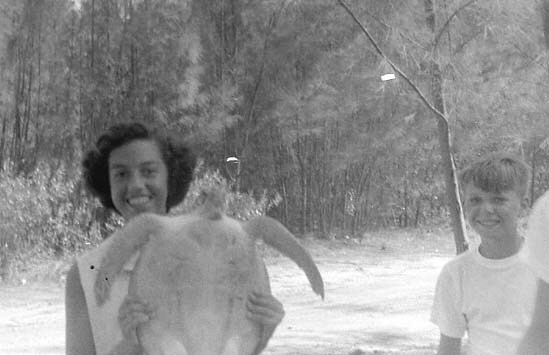 1954 Victoria holds a friendly turtle. This was taken during one of our many visits to the Crandon Park Zoo, located just outside the beach area. 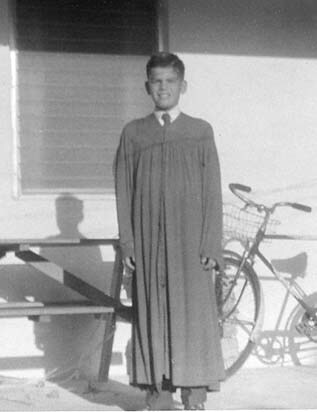 1954 Mauricio as a middle school graduate from Coral Gables Elementary in back of our house on Almeria Avenue. 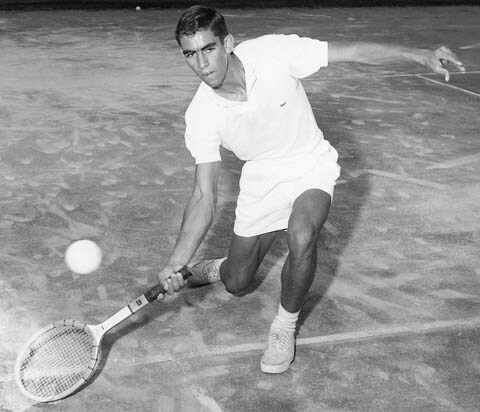 1954 Pacho practices his forehand at Salvadore Park in Coral Gables. All of us took tennis lessons from Leo Fullwood, pro for many years. 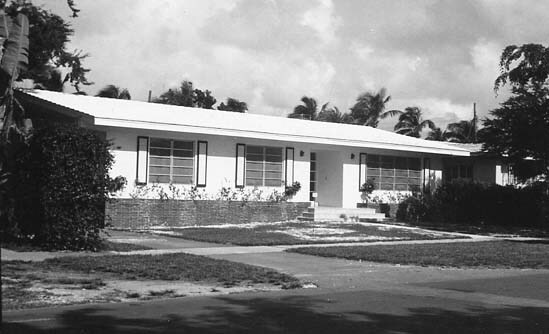 1956 A front view of our house on Almeria Avenue. We lived here just over 2 years. 1956 Here is the crew of seven with Mom in the family room of our house at 2820 Columbus Blvd., about 41/2 blocks from our previous house. 1956 It's dinnertime! Cecilia Cano, wife of Luis Gabriel Cano and one of Mom's dear friends, lived in the Gables close by. Carlos DeNarvaez stands to the right of Mom. 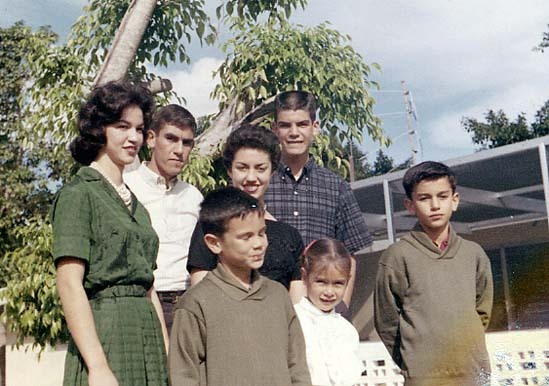 His family, also from Colombia, were good friends, and Dad enjoyed many golfing outings with the elder DeNarvaez. 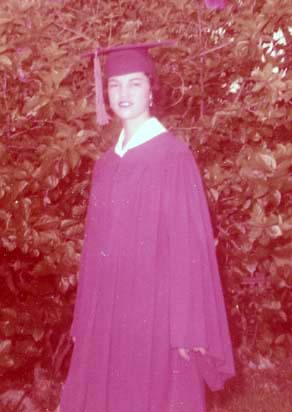 1957 Cristina, a junior high graduate from St. Theresa School. 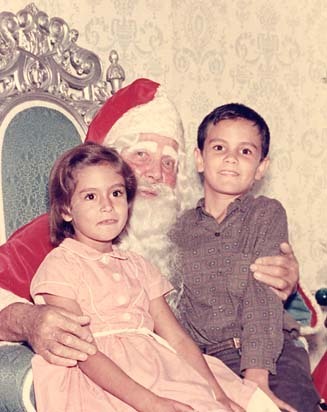 1957 Constanza and Danny receive a big Santa hug. 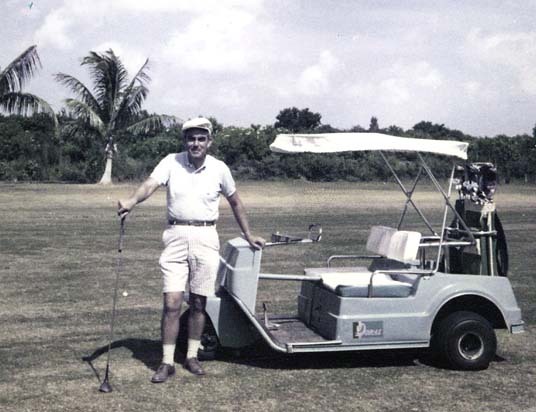 1957 Dad, always a happy camper on the golf course, plays at the Granada Golf Course, part of the Country Club of Coral Gables. 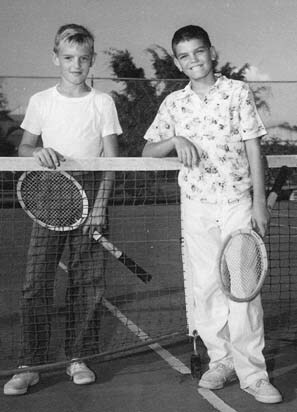 1957 Mauricio and friend after a good game of tennis at Salvadore Park. Who won?? 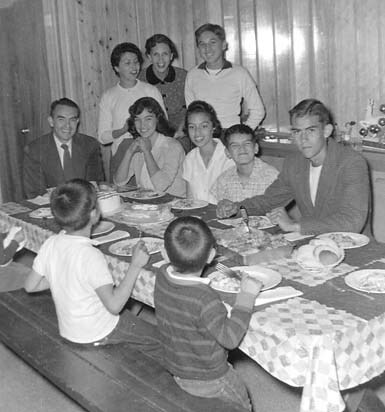 1958 St. Theresa School holds an international festival. Cristina, center, is dressed as a campesina holding her hat. 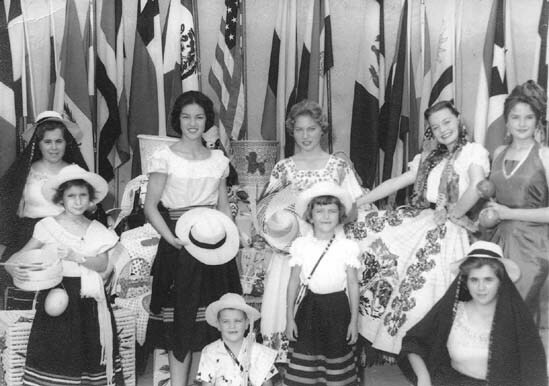 Two of the Cano children are in front, and Colombian twins Patricia and Adriana Jaramillo, are dressed in traditional Colombian costumes. 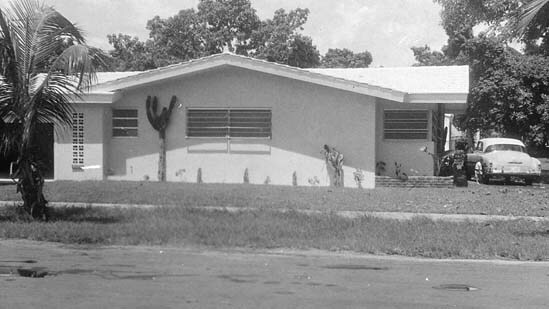 1959 We lived in two homes a block apart, one at 2820 and the other at 2920 Columbus Blvd., designed by Mom and built by Dad. 1959 It's a classic! 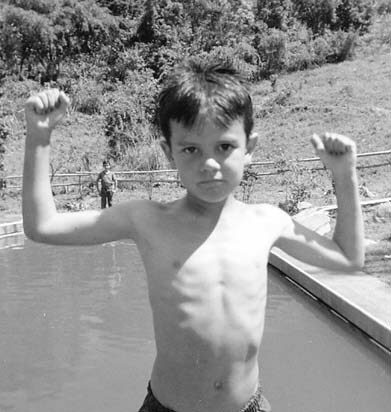 Danny, 7 yrs. old, and ready to take on whoever.... On weekends, we would drive to the outskirts of Bogotá, enjoy warmer weather and visit with friends. We all have fond memories of these fun times. 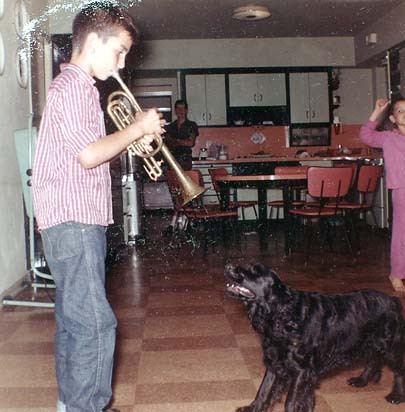 1959 Lucky, a favorite pooch, sings along with Edgar in one of our homes on Columbus Blvd. 1959 Danny, Constanza take care of Lucky in the backyard of 2920 Columbus Blvd. 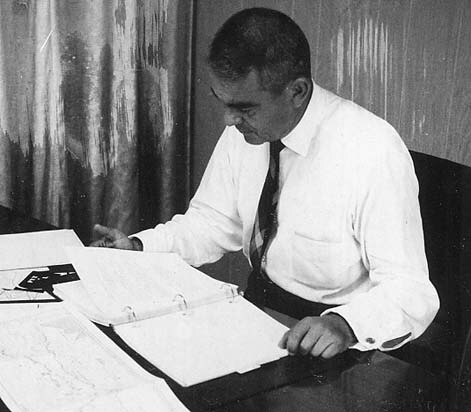 1960 Dad hard at work in his study. With Mom, they continued writing for the El Espectador well into the 1980's. Dad also founded Latin American Newspapers Representatives, selling ads for the hotels in Miami Beach to the Latino newspapers. 1960 It's the four Colombianos, with the three gringos in front. Backyard, Columbus Blvd. in Coral Gables.